Last night I finished spinning the singles from my Silkworker "Calliope" top. It's only taken me 2 months to spin 2 ounces! I love the way it looks so far and once the singles rest, I will ply it together. I don't think its common spinning practice to let your singles rest, but the way I see it, the first bobbin was finished up a couple of weeks ago, so the twist is less active than the bobbin I finished up last night. By letting the second bobbin rest, those singles should also become less active and it will be easier to ply them together. I seem to have better luck getting a balanced ply when I do this. I suppose if I was filling two bobbins a day, I could then ply them immediately and not have any trouble then either, but I just don't get that much spinning done a day (and the Majacraft bobbins are huge too!) 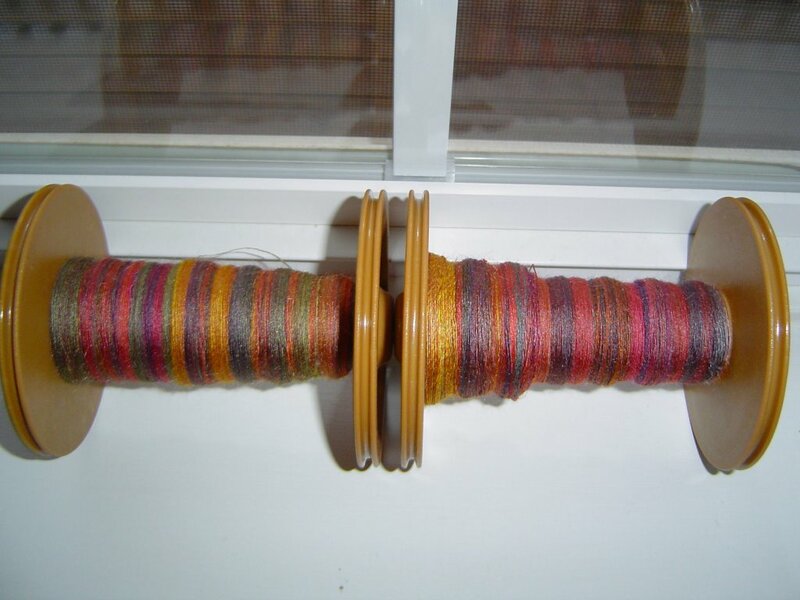 I will ply the two bobbins together rather than Navajo plying them and I think it will work out just fine. The bright colors are all yellows, oranges, and reddish pinks. These are analogous colors and look good together so where brights ply to brights, it should look good. The dull colors are all greens, blues, and purples which are also analogous, so where dull colors ply together that should also look good. Where dulls and brights ply together, it should just make the bright colors pop so that should look good. But wait, you say, the dull colors are complementary colors to the bright colors. Won't that make the places where dull and bright ply together look muddy? Well, it could, but that happens more when complementary colors are of equal tone and intensity than if one is bright and one is dull. 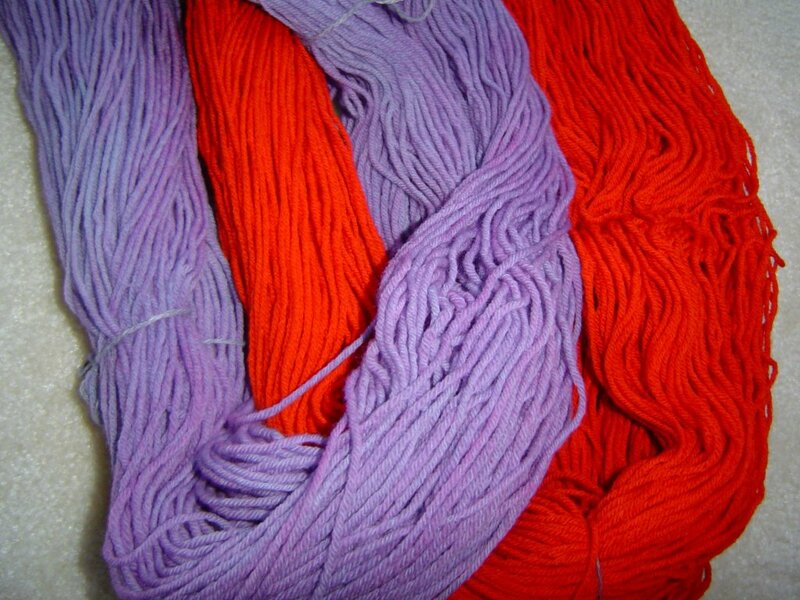 It should be interesting to see how these look as a finished yarn. I'm also really curious how much yardage I'll get. I'll probably ply these together over the weekend, so next week we can see if I'm right or crazy. Either way, it sounds like fun! Over the weekend I finished the Tigger sock. This is the Tigger sock (of the Minkey/Tigger pair of socks) because Tigger came first. 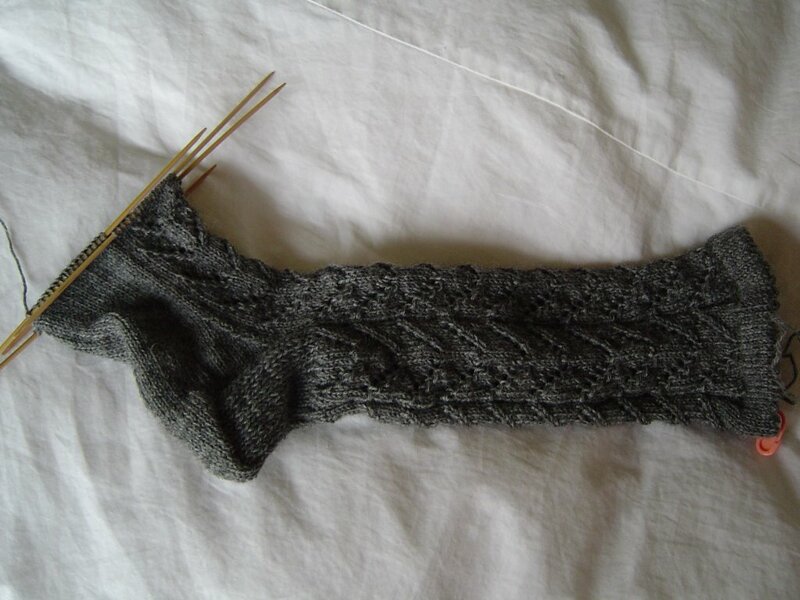 I've started the Minkey sock and I've done the ribbed cuff and am now on the seed stitch part. Obviously, these are going to be sock brothers instead of sock twins, but I think I can live with that. Ramius has pointed out that I haven't made a sock in his honor. I'm not sure if this offends him or if he was just pointing it out since he fell asleep right after he told me. 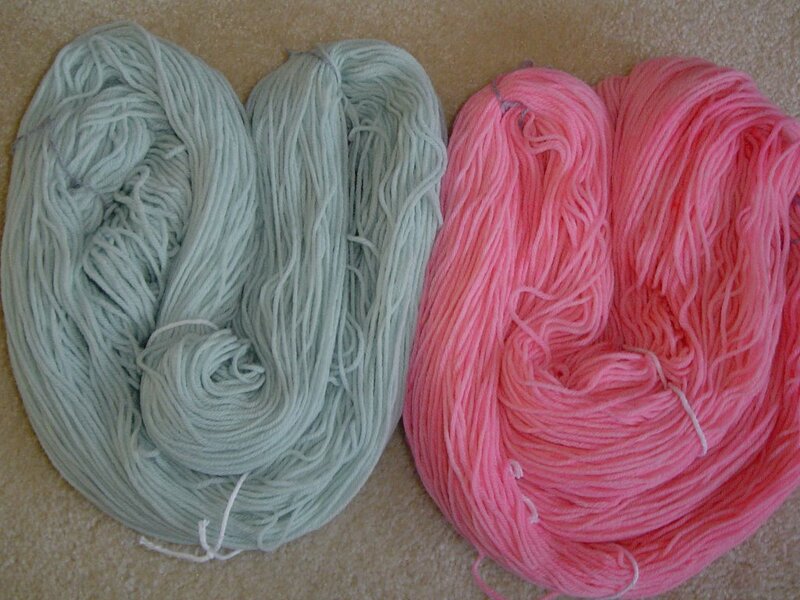 The pale blue green sock yarn that I dyed a couple of weeks ago with the pink sock yarn matches his eyes so I should probably knit that as Ramius socks. 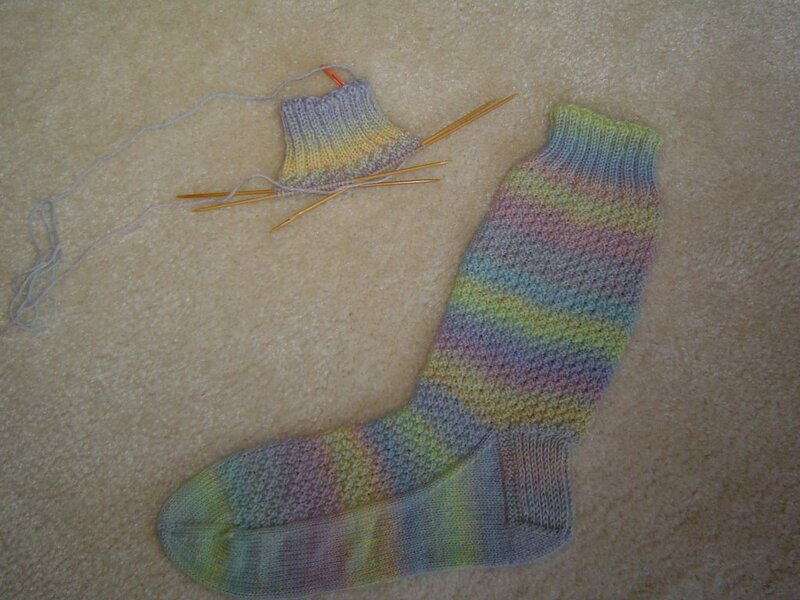 In more sock news, I've officially decided that I will be knitting 2 pairs of socks for the Knitting Olympics. I will be finding a Team USA Sock Knitting Button for the blog later. Now I just have to decide which socks to knit. Have I mentioned that I'm loving the socks this year? I've got some more thing to show you from my Post Christmas Stash Enhancement. Just so you know, all the pictures washed the colors out a little bit, so imagine the colors a little darker and richer than you see here. This is Lyrical, another of The Silkworker's gorgeous creations. Periwinkle blues are my very favorite color of blue so when I saw this, I knew I had to get it. Rick and Mindy had gotten me a gift certificate from The Silkworker - lucky me! This is Sherbet from The Woolen Rabbit. 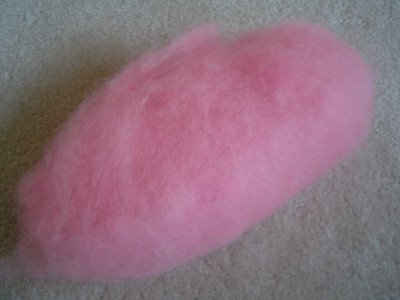 Its a Merino and Angora blend. Its absolutely gorgeous. I can't wait to see how it spins up. 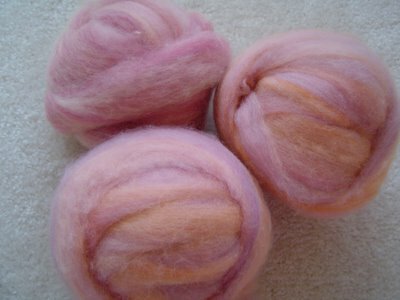 I only got 6 ounces so I might ply it with a pale pink Merino just to stretch it farther. I don't know what I'll use it for at this point, other than petting gently. Finally, this is Opalessence, also from The Woolen Rabbit. 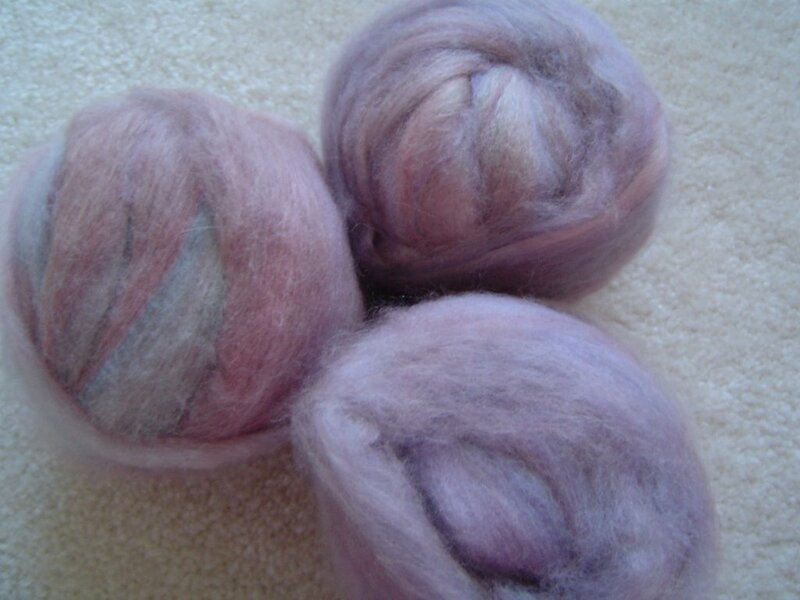 This is Merino, Silk, and Angora. Again, I got 6 ounces, but I don't have any definite plans for it at this point. I'm still spinning on my first top from The Silkworker, Calypso, and as soon as I finish a project I have to do this weekend, I'm going to get it finished up. Have a great weekend! Well, sock yarn at least. I did two more hanks of the Knit Picks sock yarn. I could see how this could be a problem for some people. You just keep buying the yarn and dying the yarn and not knitting the socks. That could be bad. But don't worry, I have it under control. I can stop anytime I want to. Really. The purple is the most uneven color I've gotten, at least when I've been trying to get the color fairly even and ironically, the red is probably the most even color I've ever gotten. Of course the red took an entire jar of Wilton's Red Red, so there was certainly enough dye to get a good even color. Again, no clue what sock pattern I'll knit with these, but I'll figure that out when I decide to knit them. I've also joined another Internet Based Group Sock Activity - Sockapaloooza! I've never done it before, but it should be fun. Here is the second half of our Smithsonian adventure - the knitting. 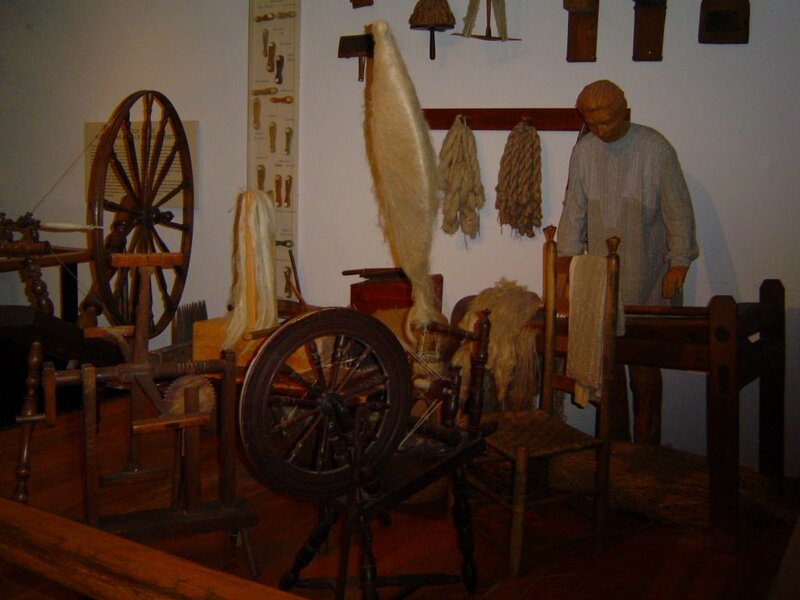 This is also in the Textiles exhibit in the Museum of American History. 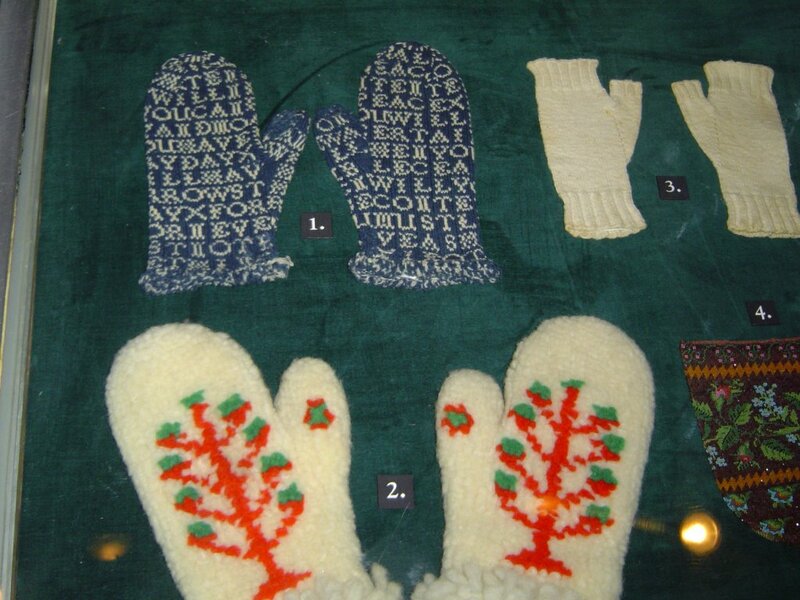 Above you can see Historical American Mittens, and look! There's even a pair of fingerless mitts there. I didn't get any notes on the mittens since a certain 5 year old had basically had it with being dragged around museums by that time. This is proof that even Historical American Knitters weren't all right in the head. 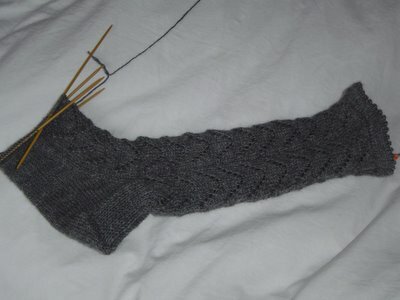 The lacy thing by the number 7 is the start of a stocking (never finished, but it would have been gorgeous). The "yarn" is somewhere between a buttonhole twist and quilting thread in thickness - yes, that's it on the spool. Number 8 is a tiny pair of knitted gloves made in China and given to some Historical Americans for something or other around the turn of the century - the one before last, not the one that just happened (aren't you glad I don't teach your kids history?). These little gloves are knitted with tiny little stitches and tiny little fingers, and even all the ends are woven in. If you look at a standard knit T shirt from today and shrink the stitches down some more from that, you'll have the stitch size about right. I'm feeling pretty good about my 10 stitches per inch socks from yesterday, but compared to these gloves, my socks look like the monster in a bad 60's horror movie. Just to add, I did email the Smithsonian about the spinning wheel/chair relationship. I haven't heard anything back from them but if I do I'll be sure to share! 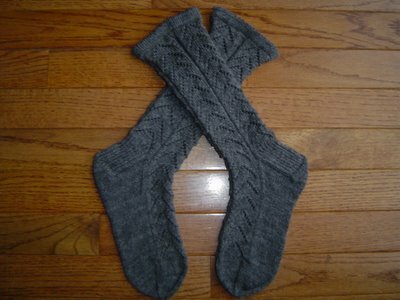 Since I finished the Latvian Socks last Friday, I had to cast on for another pair. (Yes, I had to. The safety of the world depended on it. Well, maybe not, but if Osama bin Ladin would learn to knit, he'd be too busy to be a terrorist.) This is my first pair of socks with Trekking XXL sock yarn. The color is 106 - where do they come up with these ingenious color names I wonder? I'm using Sensational Knitted Socks, the 4 stitch repeat sock with Double Moss Stitch as a pattern. I have always loved the way Moss Stitch, Seed Stitch, Double Moss Stitch and all their other bumpy little stitch cousins looked. I don't knit any of them very much though and I thought that with the gradual color blends a stitch pattern wouldn't get lost. I could spend hours just running my hands over the bumps on this sock - its just so, umm, bumpy. As I was knitting this, I had a flashback and since I'm obviously OK with sharing my innermost neurosis with you, sit back and get comfy. Its Storytime at Pink Lemon Twist! Once upon a time, there was a small Pink Lemon. She wasn't really twisted (yet). She was in Junior High (pause for dramatic groan - did anyone like that age? No you didn't, you're lying) and she had just gotten a new kitten (awwwww!). Its unclear in her memory at this point whether this new kitten was Tigger, a psyco kitten who wasn't cut out for the demands of inside living and who didn't really respect the concept of "Litter Box," (Tigger didn't stay very long - Mom put her foot down with the litter box issue) or if this new kitten was Minkey (aka Minkey Dinkey Binkey Boo. His real name was Hot Fudge Sundae, but he wouldn't acknowledge anyone who wouldn't call him Minkey). Minkey was a neurotic Birman who not only had to deal with my Junior High years, but a crazy dog, and my brother's drumset. Anyway, I decided that the kitten needed a blanket so Mom was going to teach me to knit. We picked out a variegated pastel acrylic yarn (this was before I knew I was allergic to acrylic) and I planned to make the blanket in seed stitch. I don't have much memory of learning to knit - because I didn't learn to knit then. It felt so horribly awkward and impossible I gave up. 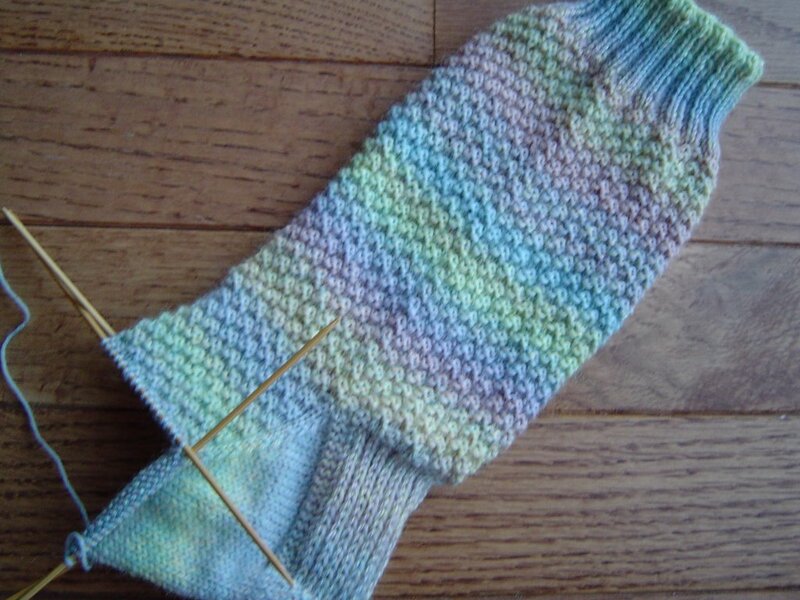 I still have that pastel acrylic yarn in my stash - no clue why, but as I was knitting this sock, I was reminded of that blanket. Wierd how that works huh? Anyway, these socks are Minkey/Tigger socks now. Umm, The End. Here they are! The first pair of socks for the year - the year being 200Sox! These are the Latvian Socks from Folk Socks. They are knit from Knit Picks Essential sock yarn on size 1 needles. I'm really happy with the way they came out and they were fun to knit. The lace pattern is easy to memorize and of course, the directions are very clear and easy to follow - even for someone who doesn't understand how a heel flap can possibly turn into a real heel. I'm just fine right here, thanks. I'm not tagging anyone, I think its been around just about all of the blogs by now! 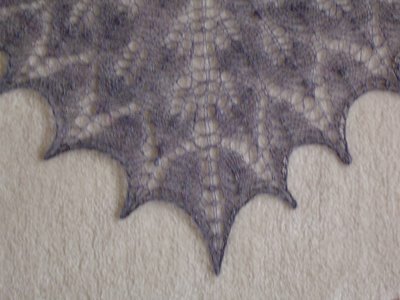 I'm almost done on the second of my Latvian Lace Socks. I should be able to finish this one today and hopefully Monday I can show you blocked, finished socks! A couple of you have mentioned the Knitting Olympics and I have signed up for it (go look, my name is on the list, really). I haven't decided what I'll be knitting yet and I haven't put the button on my blog, but maybe I can get that done this weekend too. I'm kind of playing with the idea of knitting 2 pairs of socks - that's 4 socks in 16 days, 4 days per sock - it would definitely be a challenge. Anyway, have a great weekend! Last week we went into the city (DC) and went to the Museum of Natural History (Dinosaurs!) and the Museum of American History. Not too much fiber stuff going on at the Museum of Natural History, although there was a human skeleton wrestling with a goat skeleton (this museum is seriously into skeletons - great big dinosaur skeletons all the way to little bitty mice skeletons). The purpose of this display was to show that goats were the first domesticated farm animals (I think it was around 5ooo BC - sheep were domesticated around 3000 BC). I think it better depicted that goats didn't like to be messed with back then, and they are still causing problems today. Anyway, we went on to the museum of American History and there was the fiber jackpot! An entire display - complete with really creepy mannequin person - of spinning! They show a Great Wheel, a Double Drive Saxony Wheel, Flax in various stages of preparation and wool in various stages of preparation. And look what I found, sitting in a basket of raw fleece, next to the niddy noddy... ...a drop spindle! I almost missed it, but I knew it had to be there so I kept looking. I realized though as I was taking pictures of this display, that there was something wrong with it. Can you figure out what's wrong here? The wheel is facing the wrong direction for the chair! 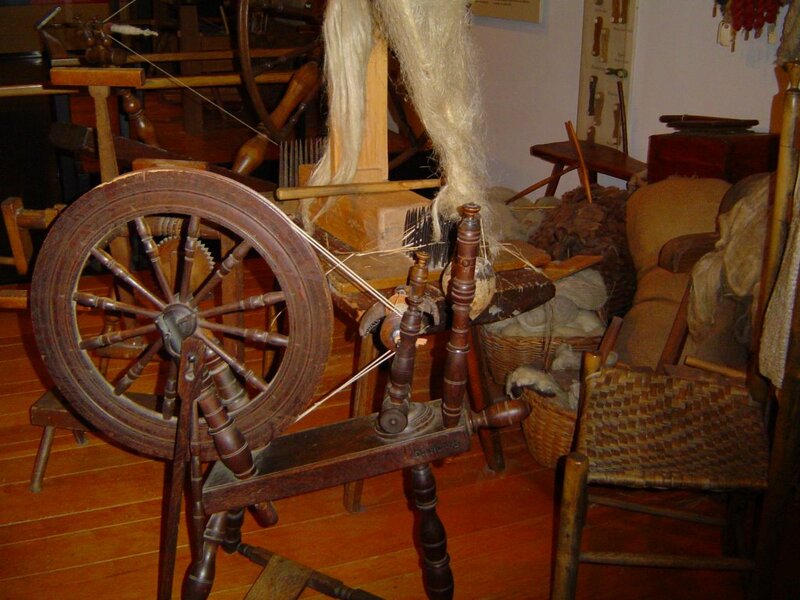 Not only can't the spinner reach the orifice to spin, but she can't even treadle with the way the chair is set up. 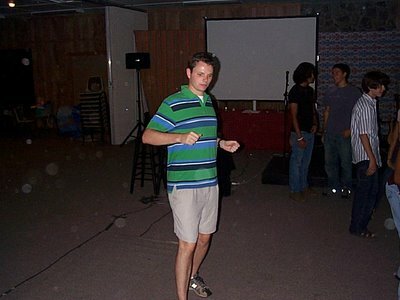 I've got to find an email address for the museum and let them know about this one. 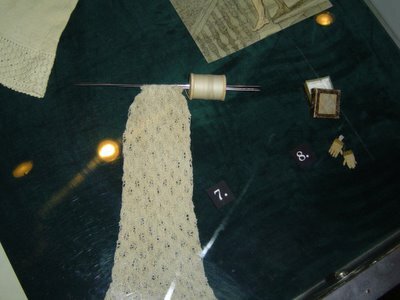 I've got more pictures of Historical American Knitting, but I'll save those for another day. By the way, due to the fact that I got 35 spam comments yesterday, I'm going to turn back on the word verification thingy on the comments. I hate that this sometimes keeps legitimate commenters from commenting (I love comments), but I don't care about lemon laws or online degrees. Hopefully, I can take the word verification thing off again after a little bit. 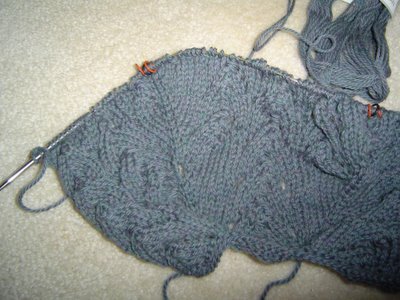 I've been working along on the cropped lace cardi. It still refuses to photograph as anything other than Loch Ness green. The fact that the Horseshoe Lace pattern reminds me of Nessie's humps means its only a matter of time before I start thinking of this cardi as the Loch Ness Monster. I am really loving the way this pattern is looking and I'm getting close to where the body and sleeves will separate (I think - I haven't tried it on yet). What I don't love? The fact that I can't remember to increase. Every wrong side row, you increase 1 stitch on each side of the black markers (they separate the front from the sleeve, from the back, from the sleeve, from the other front) to get the raglan shaping. The red markers are for the lace pattern and I only have to think about them on the right side. Can I remember to increase when I see a black marker on the wrong side? No. Its the only thing I have to do on the wrong side. I don't have to remember a lace pattern, figure out repeats, or anything else. I just purl and increase at the black markers. Do you have any idea how many times I've had to tink back to a marker because I forgot one or both increases? It makes me woozy just thinking about it. If I could remember to increase, I would probably be on a sleeve by now. 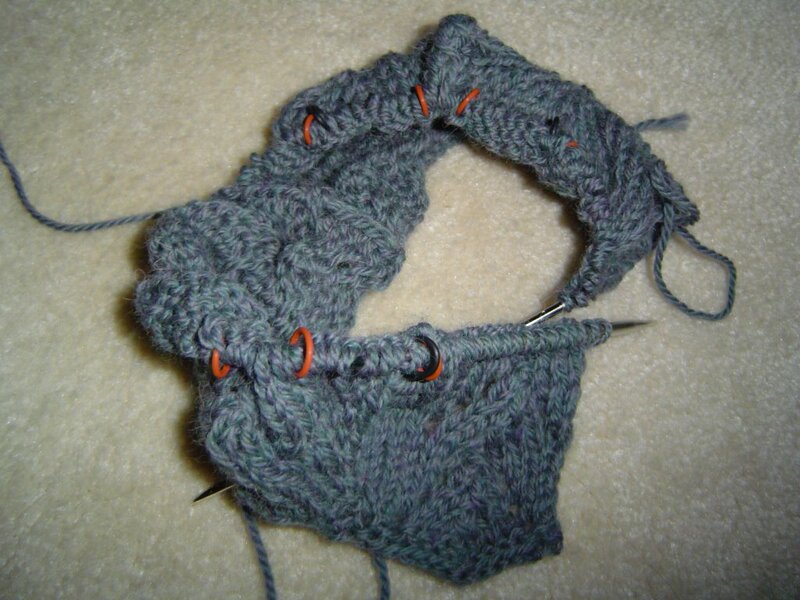 I also completed the Preliminary Round of the Olympic Knitting Stash Diving exercises. In my stash, I have yarn for 7 sweaters and 9 pairs of socks. 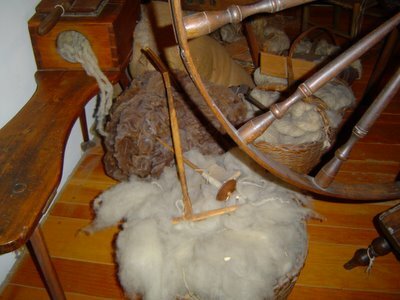 There are also singles waiting patiently to be plyed on the wheel for another pair of socks. I didn't count how many shawls are in the stash since shawls are pretty chart dependent - I don't think a shawl will make the cut, so they weren't allowed to try out for the team - yeah, they're petitioning the committee, but seeing as its made of me with some input from Ramius when he wakes up, its not looking like that ruling will be overturned. The stash yarn is now in training for the Qualifying round, where I decide what will be knitted with what pattern and if that pattern makes the cut for Olympic Knitting. I started something new! Know what that means? No stash diving report today. This is the Cropped Lace Cardi that I linked to in yesterday's post (with the Sierra Aran yarn). 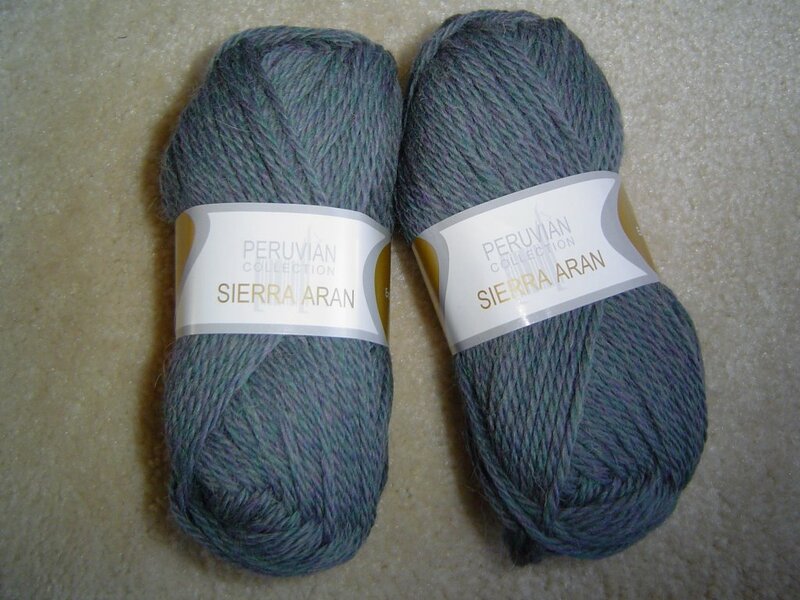 This yarn is being really difficult to photograph. I keep getting a greenish grey color - kinda like what I figure the Loch Ness Monster looks like - but in reality the color is much closer to the Elann site's picture (the color is Atlantic Mist). I'm enjoying knitting this, but I've already made changes to the original pattern. For one thing the pattern called for a crochet edging around the front and neckline. Those of you that have been reading my babble for a while now know that I don't do crochet. In order to avoid it, I did a couple of rows of garter stitch for the neckline and switched the edge stitch from one to two. I'm slipping the first stitch of each row, but I am keeping the edge stitches in stockinette so they roll to the inside of the cardi. I've also changed the stitch counts for the sleeves and back (by the way, this is knit from the top down, in one piece, raglan style) so that the lace pattern is centered. I will probably do the whole thing in Horseshoe lace rather than switching to the other lace pattern for the sleeves, and I'm seriously considering not changing needle sizes as I go because I'd like my cardi to be a little smaller than the 40 inch bust in the original pattern. So, basically, I've changed almost everything. Will it work? Who knows? If it does, I'll blog it. If it doesn't, I'll blog that too. Due to a mess here at the house yesterday, I didn't have a chance to blog, so today you're actually going to get essentially two blog entries. Twice the insanity! Woo Hoo. Something else that I've been batting around in my head (actually I realized that I needed to start thinking about it this weekend so it hasn't been in my head for long) is that the Olympics are coming up. Opening ceremonies are one month from yesterday. Now, I realize that there are people who get their Olympic fix by checking the paper or the Internet each morning, seeing the medal count, and then they go on their merry way, content with this tiny dose of athletic glory. I am not that kind of person. I am the kind of person who watches every night, keeping up with the intimate dramas of the athletes and their sports. I weep for the athlete who dedicates his performance at the Olympics to his dog who was attacked by radioactive squirrels just a week before opening ceremonies. I cheer for the longshot (I just love the various bobsled teams that come from places where you're more likely to find frozen drinks than freezing temperatures). And of course, who doesn't enjoy watching the antics of those wacky French judges? Needless to say, if there is an Olympics, there must be Olympic Knitting. Like every other aspect of the event, there are rules. 1. Olympic knitting must last for the duration of the entire Olympic games. 2. Olympic knitting must be simple patterning, easily memorized, and not chain me to a chart. I'm off to sort through my stash to see what I've got and I'll report back (there might be a blog poll later). In the meantime, let me know in the comments what your suggestions are for Olympic knitting and if you haven't already, go learn all the words to your national anthem. We really can tell when you're faking it on the medal stand. As you can see, the pattern has a different edging chart which makes points - always a nice way to end a shawl. I thought about putting some beads at the points, but I didn't have anything that matched here and was too lazy to drag myself to the bead store. The yarn has some sparkle since Kary added some gold Angelina (tiny wisps of gold colored tinsel like stuff that gets spun into the wools and silk for all you non spinners) so beads might have been too much anyway. 31 years ago tomorrow, my brother Rick was born. According to my parents, I wasn't too thrilled about it. I was 21 months old and I wanted a sister. I must have gotten over it because I soon wanted to help (in that way that 21 month olds want to be helpful, which in reality has nothing to do with actual help). My mother, knowing that while there wasn't much I could do, and knowing that I would probably hound her until she developed a nervous twitch, came up with a plan. I could carry Rick's feet. Mom would hold him way down so I could reach up and carry his feet. I must have done this alot because while I have no memory of her being pregnant or his birth, I remember carrying his feet. When I think about it, its amazing that my mom can walk upright because she is 5' 11" so she had to have been bending all the way down to get the little guy's feet where I could reach them - helpful, remember? But hey Rick, we love you anyway! Happy Birthday! The Giant Purple Waffle Thing is Getting Bigger! The Rendezvous at Dusk Shetland Triangle shawl, aka Shetland Rendezvous is almost done! I have done 12 repeats of the "body" chart and now I only have 14 more rows (the "edging" chart) and a bind off and I can block this wacky waffle looking project. 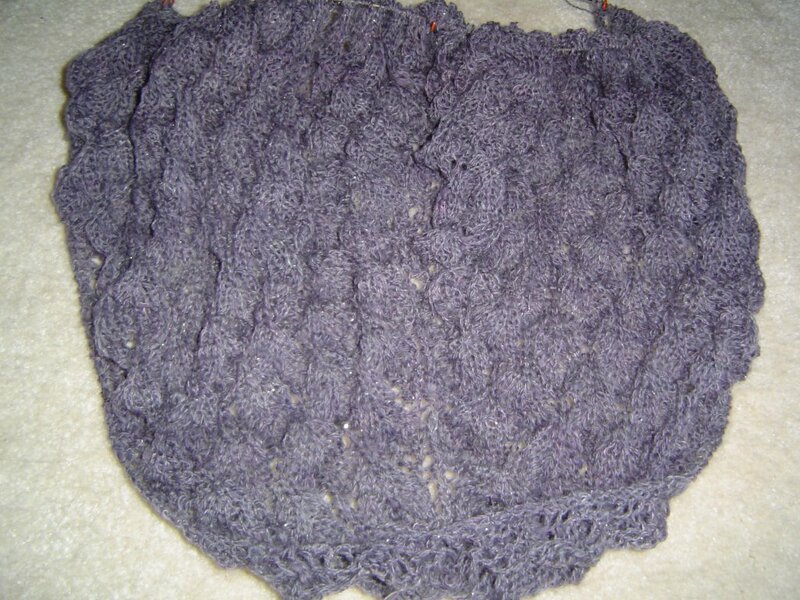 I hope to get it finished and blocked today, which will mean I've made a shawl in one week. That must be some sort of land speed record for a shawl! I mean it would be more impressive if it were done with smaller needles (US 8's here) and a finer yarn, but let's not get bogged down in the details here people! If my calculations are correct, it should be about 72 inches across the top when its all blocked out. No time for any more blogging today - there is a shawl to finish! This is what I was doing when 2005 ended and 2006 began. What is it, you ask? Its a knitted representation of the Rocky Mountains of course! 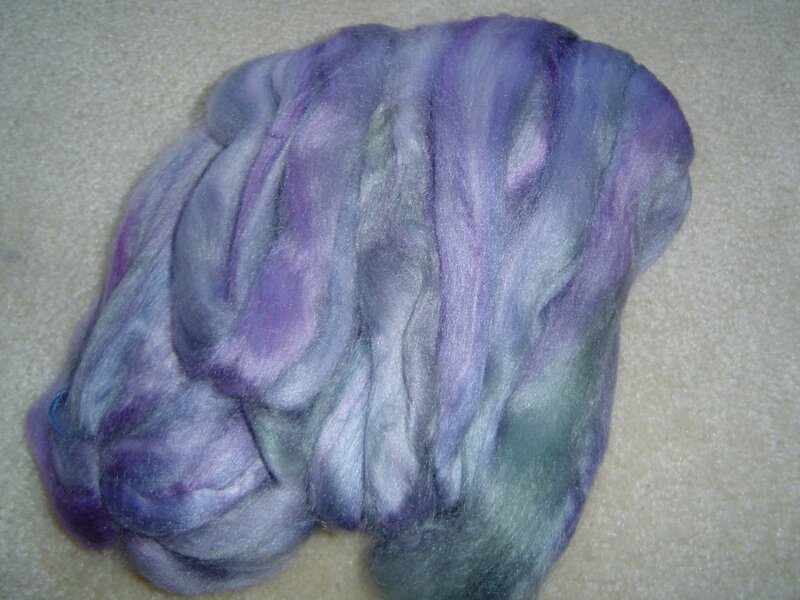 Actually it is the yarn I spun from the Kitchen Sink Batt, "Rendezvous at Dusk." 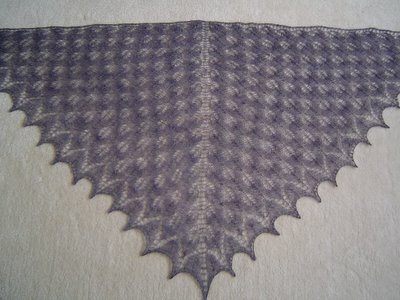 The pattern is Shetland Triangle from the Wrap Style book. 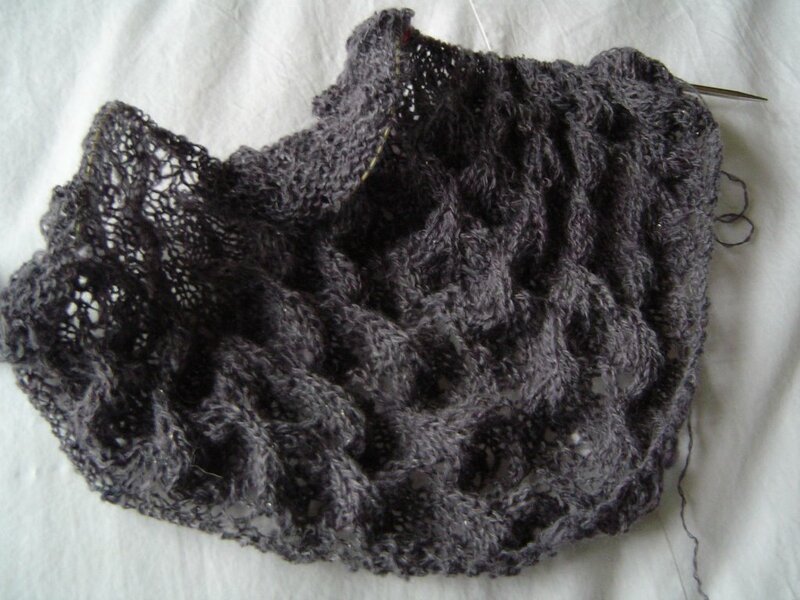 Its the traditional Fir Cone pattern, which as you can see, looks pretty crazy unblocked. Its almost like I'm knitting a giant waffle. When I spun the singles for the yarn, I spun laceweight, but after plying and washing the finished yarn, it puffed up. 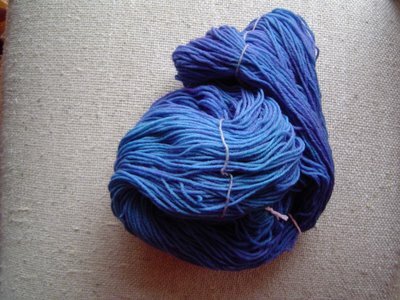 I mean it really puffed up so I have 600+ yards of a sport weight yarn. 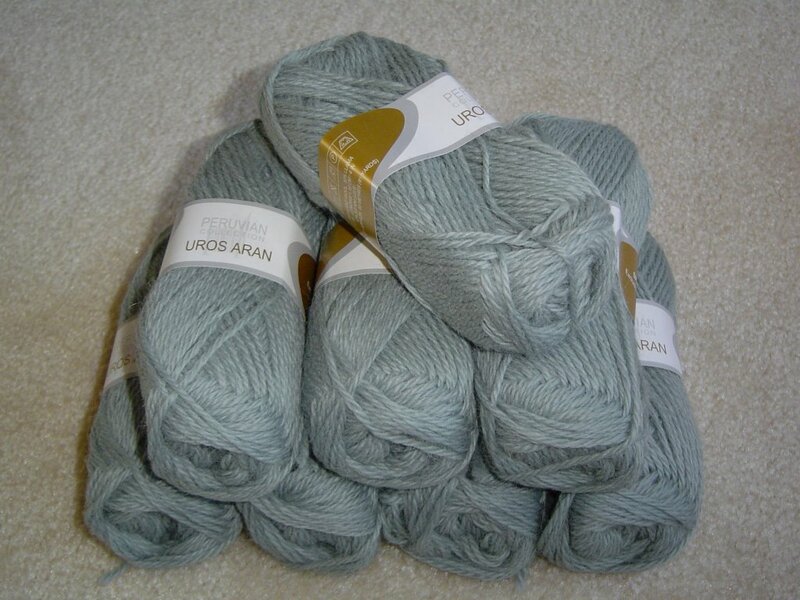 The good news is that this is more yardage than the pattern calls for, and I'm using size 8 US needles (5.0 mm). This should mean that my shawl should be bigger than the original one in the pattern, and it seems to be knitting up really quickly! I'd love to block this baby by the end of the week. Just a note, for all of you who ask questions in the comments, I'd love to answer your questions, but the way Blogger is set up to do comments, I don't get your email address. This means that either I don't answer your questions, or answering questions would take over the blog entries - I don't like either option. So, if you have a question for me, please leave your email address in the entry with the question but replace the . with DOT and the @ with AT and if it makes you feel better you can add NO SPAM somewhere in the email address too. (example: you@aol.com becomes youATaolDOTcom) This should theoretically keep spammers from getting your email (or at least they'd have to work for it) but it will let me contact you to answer your questions.